To keep the Pentagon happy, some Hollywood producers have been known to turn villains into heroes, remove central characters, change politically sensitive settings, or add military rescues to movies that require none. There are no bad guys in the military. No fraternization between officers and enlisted troops. No drinking or drugs. No struggles against bigotry. The military and the president can’t look bad (though the State Department and Canada can). Robb talked with MotherJones.com about deal-making that defines the relationship between Hollywood and the Pentagon. MotherJones.com: How far back does collaboration between the U.S. military and Hollywood go? David Robb: The current approval process was established right after World War II. Before that, the Pentagon used to help producers, but it wasn’t very formalized, like it is now. They helped producers going back to at least 1927. The very first movie that won an Oscar, “Wings,” — even that got military assistance. MJ.com: What steps does a producer take to get assistance from the military? How does the process work? DR: The first thing you have to do is send in a request for assistance, telling them what you want pretty specifically — ships, tanks, planes, bases, forts, submarines, troops — and when you want this material available. Then you have to send five copies of the script to the Pentagon, and they give it to the affected service branches — Army, Air Force, Navy, Marine Corps, Coast Guard. Then you wait and see if they like your script or not. If they like it, they’ll help you; if they don’t, they won’t. Almost always, they’ll make you make changes to the military depictions. And you have to make the changes that they ask for, or negotiate some kind of compromise, or you don’t get the stuff. After the film is completed, you have to prescreen the film for the Pentagon brass. So before it’s shown to the public, you have to show your movie to the generals and admirals, which I think any American should find objectionable — that their movies are being prescreened by the military. MJ.com: At that stage, with the film finished, what can the military do if they have a problem? They can be very spiteful, they can hurt the box office of a film, and they don’t forget, either. So you do this at your peril. They can’t arrest you, they can’t stop the film. But if you want cooperation again, and you’ve screwed them like that before, you’re not going to get it. People almost never screw the Army on these deals. MJ.com: What criteria does the Pentagon use in deciding whether to help a film? DR: The most important one is that the film has to “aid in the retention and recruitment of personnel.” I don’t want to say that’s the whole thing, but it’s the main thing. They also say it has to reasonably depict military operations. And if it’s based on history, they say it has to be historically accurate, which is really a code. They’re much less interested in reality and accuracy than they are in positive images. They often try to change historical facts that are negative. Like with the movie “Thirteen Days,” which was very accurate but very negative toward the military during the Cuban missile crisis, showing that they would have taken us down the path toward World War III. During the negotiations with the producers, Peter Almond and Kevin Costner, the military tried to get them to tone down the bellicose nature of Gen. Maxwell Taylor and Gen. Curtis LeMay — who the record is very clear on, because before Nixon was taping in the White House, Kennedy was taping in the White House, and all the conversations from October 1962 are on tape. When Kennedy rejected LeMay’s insistence that we attack Cuba — when Kennedy said let’s put up a naval blockade, we don’t want to get into war — you can hear Curtis LeMay say, “This is the worst sellout since Munich.” He actually said that, when he didn’t think anybody was listening. Well, the military wanted to change it anyway, saying he was too bellicose and they had to tone it down. To their credit, Kevin Costner and Peter Almond stood up to the military, refused to buckle under, and made their film without military assistance. MJ.com: Why don’t more producers take that approach? DR: A lot of the studio heads tell their producers, “We’re not going to make this film unless we get military assistance, because it would be too expensive. So you’d better make sure the script conforms to what they want.” Also, what you don’t see in these documents is the self-censorship that goes with knowing you need their assistance and that they’re going to be your first audience. Writers write stuff to get that military assistance. So there’s no documents saying, “In “Black Hawk Down,” let’s leave out the whole part about the soldiers being dragged through the streets of Mogadishu.” Jerry Bruckheimer knows that if they have that in there, the military’s just going to tell them to take it out or they won’t help them. I asked Ridley Scott, the director, if “Black Hawk Down” could have been made without military assistance. He said, “Yeah. We just would have had to call it ‘Huey Down’.” So there’s this self-censorship. When you know the government is looking over your shoulder while you’re typing, that’s a very bad situation. MJ.com: Aside from showing war crimes, what are some of the other things the military balks at? DR: They never — at least that I’ve seen — help movies with aliens. Usually in those movies, the military is shown to be ineffective in combating the aliens, and it’s always some tricky, enterprising person who figures out how to defeat them. Like in “Mars Attacks!,” a grandma playing Slim Whitman over her radio blows the aliens’ heads up. Well, the military didn’t want to help them. They don’t want to help any movie that shows them being ineffective, even in combating aliens. They have no sense of humor! They wouldn’t help “Independence Day.” The military could not get over the fact that one of the key plot points was that the U.S. was secretly working on a spaceship captured at Area 51, so the film ended up not getting assistance. Another thing, they don’t like drinking or drugs in the military. They’ll make you change that. Like in “Stripes,” they made them take out all drug references, and the original script had lots of drug references. They don’t want to see any pot smoking, even in Vietnam. The former Navy Secretary James Webb, after he left that post, he became a book writer. He’d been a Marine in Vietnam, and one of his books was semi-autobiographical, with many of the things he saw and knew for a fact happened in Vietnam: fragging of officers, smoking pot, burning Vietnamese villages. He had a screenplay and wanted to turn it into a movie. They said, “No, you have to change all this stuff,” and he wouldn’t do it. So that’s a film that never got made. Many films have never been made because they couldn’t get assistance. MJ.com: In the book, you give examples of how the Pentagon won’t allow military characters to be depicted as bad guys. DR: Right. For example, there was an HBO movie “The Tuskegee Airmen,” where the military made them replace the villain. This was a movie about the first black airmen during World War II, where the bad guy was a general at the base where these guys were training, and the good guy was a white congressman. Well, the army said they didn’t like that, so they ended up changing it. I have a letter where the producers wrote to the military, to Phil Strub, who’s the head of the Pentagon’s film office. The producers wrote, “The following changes are in the works and will soon be fully executed by the writer. It is our intention to reverse the characterization of General Stevenson and Senator Powell, making the senator the source of bigotry. General Stevenson will be revealed as someone who is loyal to the efforts of the Tuskegee Airmen.” Now when people saw that film, they had no idea that the good guy and the bad guy had been reversed, just so the military could meet its recruiting goals. DR: In those cases, they recognized that children are the future recruits. With the “Mickey Mouse Club,” it’s kind of a long story, but they used to show these little documentary films called “Mouse Reels.” For example, they took these kids out on the U.S.S. Nautilus, which was the first nuclear submarine. And there’s a Pentagon document that says, “This is an excellent opportunity to introduce a whole new generation to the nuclear Navy.” It was all military propaganda to show how “child-friendly” nuclear submarines are – there’s hardly any radiation, the food is great, they even have a jukebox that plays the “Mickey Mouse Club March” in the cafeteria. As far as reaching children, I think one of the best examples — and they’re very candid in these documents, because I don’t think they ever expected anybody to be looking at this stuff — there was this movie “The Right Stuff” about the early days of the space program. The original script was filled with vulgarity and cussing, and the military sent the producers a letter. It reads, “The obscene language used seems to guarantee an ‘R’ rating. If distributed as an ‘R’, it cuts down on the teenage audience, which is a prime one to the military services when our recruiting bills are considered.” Of course, an ‘R’ rating means children under 17 have to be accompanied by a parent, so a lot of 16- and 17-year-olds couldn’t see this picture. And the Air Force wanted young people to see this so they’d get a good, positive image of the military and join up. So they changed it. MJ.com: Among the films you looked at, which went through the most radical change from the script to the final, military-assisted movie? DR: There was a movie called “Air Strike” by a guy named Cy Roth. Now, Ed Wood is often credited as being the worst director in Hollywood history, but Cy Roth would really give him a run for his money. Roth decided around 1953 that he’d made a Western, he’d made a space movie, now he wanted to make a war movie. This movie was set on a World War II aircraft carrier, and the lead characters were a young Jewish flyer and a young black flyer who are constantly being subjected to anti-Semitism and racism on the ship. The military said, “No, we don’t want to show any kind of racism or anti-Semitism in this picture, you’ve got to change that.” They also said, “We don’t want a World War II-era picture, we want a movie set in the modern jet age.” And Roth went nuts. He called his congressman, he wrote a letter to President Eisenhower — and the day after the White House got his letter of complaint, they sicced the FBI on him to see whether he was a Communist or not. Well, he finally caved in; he made the picture the way they wanted. So it was no blacks, no Jews, no propellers. If you look at this film, it’s so bad, it looks like a home movie shot on an aircraft carrier. So this film was completely changed. MJ.com: You argue that this military screening process violates the First Amendment. DR: The First Amendment doesn’t just give people the right to free speech; fundamentally, it prevents the government from favoring one form of speech over another. There’s a great 1995 Supreme Court case called Rosenberger v. University of Virginia that says, “Discrimination against speech because of its message is presumed to be unconstitutional. It is axiomatic that the government may not regulate speech based on the substantive content of the message it conveys. In the realm of private speech or expression, government regulation may not favor one speaker over another.” And yet that’s what they’re doing every day. Not just 50 years ago on “Air Strike,” but right now. This is a holdover from the Cold War, and it should be abolished. Or at least Congress, which has oversight over the Pentagon, should really look into what’s going on. Congress has only looked into it twice, when Robert Aldrich made a stink about not getting assistance for the movie “Attack,” and then again in the 1960s when it turned out the government had footed the entire bill for all the military stuff on John Wayne’s “The Green Berets.” In these two investigations, the Pentagon basically said it’s not their intention to influence the content of movies. And Congress just accepted that. If they looked at these documents, they would see that clearly the intent is to influence the movies. Major Georgi, who had been the military minder on many movies, said that one of the targets of this program is Congress; that Congress goes to movies, and that when they see positive images of the military, that makes it easier for them to vote for that $500 billion military appropriation. They also target voters, the people who are really footing the bill. Really, if you talk to soldiers and sailors and Marines, many of them will tell you they joined the military because of some movie that they saw. The former head of the Marine Corps film office, Matt Morgan, he told me he joined the military after seeing “Top Gun.” After “Top Gun” came out, there was a huge spike in recruitment for the Navy flying program. They know that it works. People are going off to war and getting killed, in part because of some movie that they saw that was adjusted by the military. MJ.com: What would it realistically take to change this system? DR: I think that if just 50 people wrote their congressman and asked, “what’s going on here?,” I think it wouldn’t take much. It’s not going to happen otherwise. The Writer’s Guild, whose stated mission is to protect the creative and economic rights of its members, has never made a single protest that its members’ scripts are being manipulated and changed by the military. Congress has done nothing. 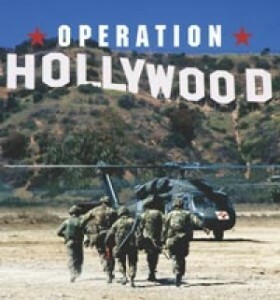 Hollywood likes the way it is, and the military likes the way it is; they don’t want to change it. The only people who have a real interest in this are the American people. They’re being saturated with military propaganda in their mainstream movies and TV shows, and they don’t even know. But I think there’s a very good argument that can be made that over the past 50 years, this chronic sanitization of the military and what war is has affected the American character; that we’re now a more warlike people than we were 50 years ago. Clearly, there are also other reasons, but I think when the world’s most powerful medium colludes with the world’s most powerful military to put propaganda in mainstream films and television shows, that has to have an effect on the American psyche.